Okay, I know that it’s a problem worthy of psychoanalysis that I’m so fascinated with the Request for Proposal (RFP) process. But, hey, I do a lot of them. And they do say to write about what you know. The presentation that I gave at NTEN’s conference in March focused on the process of developing and managing RFPs. I made the case that you want to approach a vendor RFP very differently than you would a software/system RFP. I pushed for less fixed bid proposals, because, in many cases, asking for a fixed bid is simply asking for a promise that will be hard to keep. ROI involves far more than just the dollars spent on projects like CRM deployments and web site revamps. In the session, I learned that Requests for Information (RFIs), which are simpler for the vendors to respond to, can be a great tool for narrowing a field. It’s important that clients are respectful of the fact that vendors don’t get paid to respond to proposals; they only get paid if they win the bid, and showing respect on both sides at the very glimmer of an engagement is a key step in developing a healthy relationship. Since the conference, I’ve gotten a bit more creative about the software that we use to manage the RFP process, and I wanted to give a shout-out to the tools that have made it all easier. There are alternatives, of course, and I still use the Microsoft apps that these have replaced on a daily basis for other work that they’re great at. But the key here is that these apps live in the cloud and support collaboration in ways that make a tedious process much easier. Share the document with whomever I choose; the whole world or a select set of invitees. Google’s sharing permissions are very flexible. With Word, I had to email and upload a document; with Google Docs I only have to share a link. I can share it as a read-only document that they can comment on. This simplifies the Q&A portion of the process, while maintaining the important transparency, as all participants can see every question and response. We recently did an RFI for web development (it’s closed now, sorry!) and here’s what it looked like, exactly. 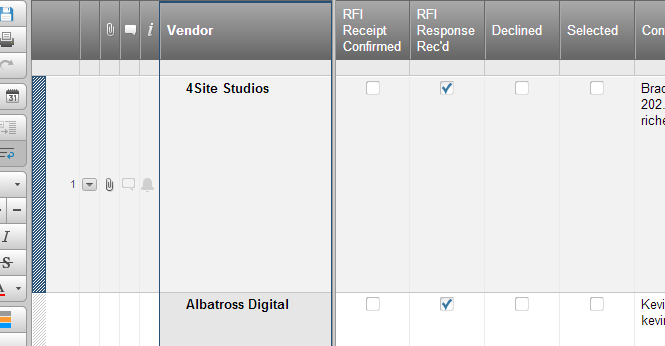 Smartsheet is replacing Microsoft Excel as my response matrix platform. The first step upon receiving responses to a request is always to put them all in a spreadsheet for easy comparison. Smartsheet beats Excel because it’s multi-user and collaborative. Since Smartsheet is a Spreadsheet/form builder/project management mashup app, I can add checkboxes and multiple choice fields to my matrix. For simple proposals, you can also easily use Smartsheet to collect reviewer comments and votes. Just add a few columns (two for each reviewer). This puts the matrix and evaluation criteria all in one place, that can easily be exported to spreadsheet or PDF in order to document the decision. 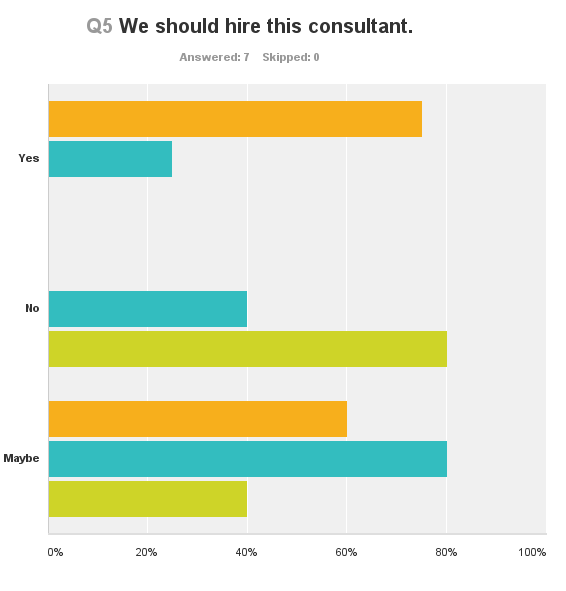 Surveymonkey has replaced Excel for cases when the evaluation criteria is more complex than a yes/no vote. Using their simple but sophisticated questionnaire builder, you can ask a number of questions with weighted or scaled answers. The responses can be automatically tallied and, as with Smartsheet, exported to Excel for further analysis or published as charts to a PDF. As I’ve ranted elsewhere, making a good investment in software and vendor evaluation has a big impact on how successful a project will be. Working with staff who are impacted by the project in order to choose the partner or technology increases buy-in and the validity of the initiative in the eyes of the people that will make or break it. And a healthy process insures that you are purchasing the right software or hiring the right people. These tools help me make that process easier and more transparent. What works for you? This entry was posted in NPTech and tagged cloud, google, rfis, rfps, smartsheet, software, strategy, surveymonkey, vendors on May 14, 2014 by Peter Campbell.